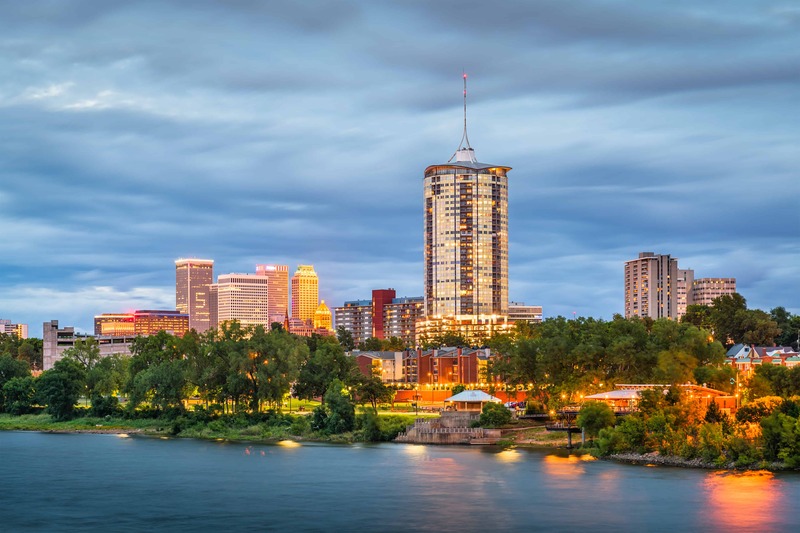 At a glance, Tulsa might not seem like it has many interesting things to see and do. Moving here from the beach, I was concerned that the landlocked state wouldn’t offer half as many things to do as I was used to. I’m happy to report that Tulsa is actually a great place to live with plenty of unique activities to keep both locals and visitors entertained. Here are a few of the gems I’ve stumbled upon in my past three years living here. My friend surprised my wife and me one night by taking us to the Bull in the Alley. While most restaurants have large neon signs to indicate their location, this restaurant takes a much different approach. My friend led us away from the main road where we had parked and into the maze of alleyways. It was a dark night with no moon and the city was already growing sleepy. In the forefront of my mind, I considered how unsafe this was seeing how you’re usually told to never go lurking between buildings in the dark. My friend took a turn and stopped. He pointed up to a little golden bull statue sticking out from the brick, then he reached out, grabbed a handle on the wall, and pulled. Suddenly, we were introduced to a bustling high-end restaurant hidden from within. We went on to enjoy a night of fancy food as well as basking in awe at the restaurant that’s hidden in an alley. Bull In The Alley knows how to create mystique and intrigue; its reputation and knowledge of its location comes only from word of mouth. If you’re looking for a unique thing to do one Tulsa night, try a scavenger hunt where the main goal is to find the golden bull. Chandler Park is located across the river from Downtown Tulsa on top of a hill. It’s a quiet park where you can enjoy nature and a view of the skyline. There are many things to do for all ages, including frisbee golf, playgrounds, and picnics; however, it’s most well-known for its active rock-climbing area. Chandler Park makes my list because you won’t be able to find any other park like it in Tulsa. While it certainly isn’t the Gathering Place (We’ll come to that,) it stands out because of its labyrinth-like natural rock formations. The first time I visited I felt like I was on some kind of movie set. From the outside, you see a quiet level park, but when you step down into the woods, you are introduced to a world of imagination and fantasy. Rock walls intermingle with towering trees, creating narrow passageways and staircases. The rock formations can tower to thirty feet in height. If you’re a climber, there are walls that suite all levels. Even if you’re not a climber, setting up a hammock between some trees and enjoying the rocky views is a great way to spend an afternoon. Also, if you’re into photography, you can probably get some cool shots. Either way, Chandler Park makes for a unique outing and its just minutes from the city. A little known fact, even among Tulsa locals, is that there is a large network of tunnels that run all beneath downtown Tulsa. Being traced back to the days of Prohibition, bootleggers used the tunnels to cart alcohol secretly throughout the city. The times have changed, however, and you can now find the usual corporate worker taking the tunnel to avoid bad weather. While I’ve yet to thoroughly explore these tunnels myself, it’s something I definitely plan on doing. If you’re interested in the history of the tunnels, some tour companies like this one offer guided tours. You can read more about the tunnels here. The Tulsa Balloon Festival is 5 day, annual event that takes place in the late Spring or early Summer. If you want to enjoy some festival fun and see some wonderous hot-air balloons, then this is the place for you. Either enjoy the nostalgia or create the memories by taking part in the carnival rides and concession stand food. If you are wanting to go up in one of the balloons, be prepared to turn over some money. Unfortunately, the night I came the weather was bad so the balloons weren’t able to take off. But even apart from this, the atmosphere alone is worth coming for. Keep in mind, entrance to the event is free, but there is usually a parking fee of $20 dollars per vehicle. Here’s the official website for the Tulsa Balloon Festival. Not only is this a unique thing to see in Tulsa, but this particular statue is also something that puts Tulsa on the map; Oral Roberts University has a giant bronze statue of praying hands weighing around thirty tons and reaching heights of sixty feet tall sitting towards the West-side of the campus. They’re easy to spot from the road, and anyone is welcome to stop by and take a look. Its a great way to be welcomed to the Bible Belt of America. Oral Roberts was an evangelist in the 1950s and continued to affect people for the rest of the century. The giant praying hands of Tulsa not only symbolize the reason for his school but also plays a part in recognizing quite a few other churches and their faith in the area. If you’re ready for a challenge, you’ll definitely want to check out Climb Tulsa. After several years of construction, the world-class climbing gym finally opened for business in 2018. The gym is massive. With 50 foot high walls, and enough room for at least 170 people to climb at one time, this place is quite a sight to behold. In addition to offering climbing, the facility also has a fitness area, yoga classes, and a gear shop. No climbing experience? No problem. There are intro classes for people that want to get started. A word of warning though. Their memberships are a bit pricey, but they do offer special discounts for students, military, and families. You can check out their latest pricing guide here. Okay, I know the Gathering Place is probably mentioned on every list ever made about things to do in Tulsa by this point, but it’s still worth mentioning for those not from the area. The Gathering Place is incredible. No really, it is. It spans a hundred acres, took four years to construct, and cost $465 million dollars. And the really incredible part? Entrance to the park is completely free. The park is nothing shy of amazing and breath-taking; there are multiple dining options throughout the park, ranging from quaint little ice cream shops to cheap fast dining to even gourmet sit down dinner options. There are meticulously designed lounging areas that give the impression that you’re on a rooftop in New York City. There are many awesome things to do throughout the park from the skate area to the swing hill, to the insanely-designed playgrounds. Words can’t even describe the magnitude and the authenticity of The Gathering Place. There are more features in the park than I could possibly mention in this article, so you can read about it to your heart’s content on their official website. If you’re looking for something a bit quirkier to do in Tulsa, why not check out the Center of the Universe? I mean, it sounds pretty epic, right? While I’m not quite sure if it is the real center of the universe, it can be almost considered the center of the United State of America. A unique fact about Tulsa is that it just happens to be right in the middle of the country! Located in downtown Tulsa, the Center of the Universe is comprised of a circle of bricks. If you stand in the center of the circle and make a sound, the sound is echoed back to you much louder. It’s also to be noted, to those standing outside of the circle, any sounds made within the circle sound distorted. If you plan on visiting, the Center of the Universe is conveniently located close to the Oklahoma Jazz Hall of Fame and the Tulsa Honors Orchestra, so you can always combine the outings! When the weather is good, Guthrie Green is one of my favorite places to visit in Tulsa. Guthrie Green is a well maintained, outdoor venue in Tulsa’s Arts District. In the Spring and Summer months, something is almost always going on at Guthrie Green. Whether it’s yoga classes, festivals, concerts, or outdoor movie nights, you’re bound to find something fun to do at Guthrie Green. One of my favorite events regularly held at Guthrie Green is Food Truck Wednesday. Local food trucks from all around Tulsa gather at Guthrie Green from 11:00 AM to 2:00 PM. The food is well priced, tastes great, and the fresh air is refreshing if you’re in the middle of your workday. In addition to the food, there’s usually the added bonus of live music as well! Tulsans love movies, and there’s nothing better than watching old Westerns in a movie theatre that dates back to the days of the wild west. A lot of people don’t know that Tulsa is home to a nonprofit and historic movie theatre by the name of Circle Cinema that dates all the way back to 1928. They’re constantly showing a unique selection of films that you won’t be able to find at any other theatre in Tulsa, so they’re worth checking out if you’re looking to mix things up. They also occasionally have special speakers, audience discussions, and educational displays. The best way to know what’s going on is to check out their official website. If you’re looking for a way to shake up your typical outings, then I hope this list did the trick. There are many unique and eclectic things to do and see throughout the Tulsa area, and you usually don’t have to travel to far for any of them. Looking for even more to do in Tulsa? Check out our article on the best Tulsa Date Ideas!